Little J and I were bright awake at 6 a.m. (still on Sugartown time, which means we actually slept-in two hours!). Letting Dennis have a few more well-deserved hours of rest, the Little one and I slipped out in our bare feet, and headed down to Brennecke’s Beach. We arrived just in time for sunrise. Little J, in his too-tight goggles, his skinny, long limbs, and volcanic energy, charged into the waves like some kind of crazed fish who’d just seen the ocean after a long while of trying to live on land. His little fists pump the air with excitement, and his cries are born of something between delight and pent up frustration. I fly in after him, flinging my hat, sunglasses and towel away from me. Together we dive and splash and gasp and laugh. Every wave, though totally expected, knocks us down like some wild news that we were the last to hear. We’ve gotten good at this, as a family, I realized. We don’t try to take a wave until it’s right upon us, crashing down. Then we dig in our feet and brace. If it is too strong and drags us under, so be it. In the space between the waves, we laugh hysterically, pointing at each other like new-found friends. Exhilarated. This goes on for at least an hour, and I’m totally spent. It’s more energy than I’ve exerted in a long time. The only way I can get Little J to rest is to bury him in the sand up to his neck. This works for a short while since he’s laughing so hard, the sand is falling away faster than I can pile it. He can’t resist the urge to unearth himself and races back into the water. I follow suit, but now we’re floating. Not bashing against the waves. The golden light of the early sun plays on the water, our skin. It flickers and mingles with what I can sense as healing energy that rises up from deeper water to just below the surface, where we’re suspended gravity-free, at last. It is somehow a perfect baptism by the alchemy of saltwater and surrender. I think of Chris and Bob, Monica’s parents. Kind enough to share their Hawaiian home with us, they’ve made this retreat of renewal possible. Little J and I shout a loud, “Thank you! !” that we hope will fly across the two oceans that separate us and fill their hearts with the spirit of Mahalo Nui Loa during this difficult time they’re facing. We send them (and you) love and energy to crash through unexpected waves and to float when you can. Beautiful images of you and Little J at the beach. What a boost to be at the ocean. Enjoy your time, and soak it all up! Hugs. Awesome!! I can’t wait for our renewal time soon! Enjoy and soak up all that Aloha spirit …. it lingers even when you get home, I’ve noticed. 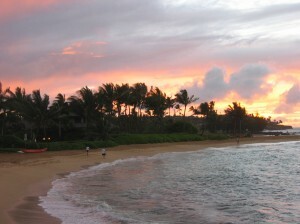 I am really glad to hear that you are having such a wonderful time in Hawaii. I can picture you and little J splashing the water, as if I can hear you guy’s laughing. We often think of you. what an evocative post jenn. i felt like i was almost there with you guys. keep enjoying that healing spirit of Hawaii also consisting of relaxing time spent in the sun & surf with your boys! Ahhh. Your exquisite ability to put happiness into words touches all of us who are lucky enough to read those words. Thank you for taking all of us to the island with you!